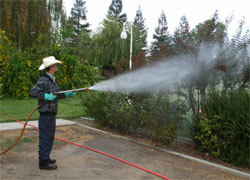 The Spray Applications Permit covers the point source discharge of biological and residual chemical pesticides to waters of the U.S. resulting from spray applications by the California Department of Food and Agriculture. The permit does not cover California of Food and Agriculture discharges on tribal lands which are regulated by a federal permit. Grant a regulatory exception to the California Department of Food and Agriculture from complying with pollutant receiving water limitations pursuant to the California Ocean Plan and/or the Policy for Implementation of Toxics Standards for Inland Surface Waters, Enclosed Bays, and Estuaries of California. Vector Control - See Section 2200(b)(6) for the permit term fee. Other Pesticides Permits - See Category 3 of Section 2200(b)(9) for the base annual fee. Add a 21 percent surcharge for the total annual fee. Please Note: The California Water Code requires the State Water Board to adjust the fees each fiscal year to conform with the revenue levels set forth in the California Budget Act. Thus, the fees could change every year. Any pending Board item is subject to the ex parte communication disclosure requirements of Water Code section 13287. Any communications between interested persons and board members (other than at a noticed board meeting or submitted as a comment letter in compliance with the public notice) must be disclosed by the interested person within seven days of the communication. Sample disclosure forms are available. Beginning 14 days before scheduled adoption by the Board, ex parte communications between interested persons and board members concerning any Board item are prohibited.